the Bike Line in Broad Ripple is OPEN during construction! 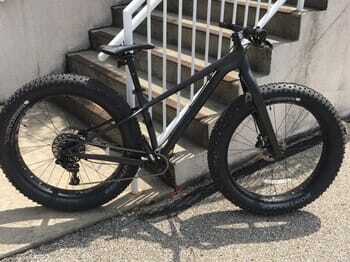 Farley 7 is the mountain biker's fat bike. 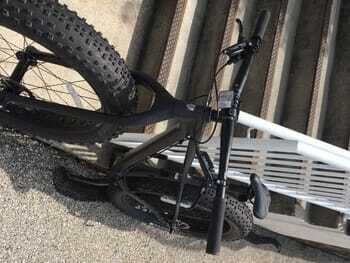 It's built to feel like a traditional mountain bike with way more capability. The lightweight aluminum frame, SRAM 1x drivetrain, and Manitou Mastodon fork make it the ideal ride for trail-shredders who want to get rad in every season. A lightweight Alpha Platinum Aluminum frame with Stranglehold dropouts, a Manitou Mastodon suspension fork with an air spring and lockout feature, a wide-range SRAM NX 1x11 drivetrain, and Tubeless Ready SUNringlé Mulefüt wheels paired with extra-grippy 27.5x4.5˝ Bontrager Gnarwhal TLR tires. Please bring this print on demand voucher to pick up location is 6161 Fall Creek Rd. Indianapolis, IN. 46220. Call Jason at 765-744-4778 to set up a time to pick up your new bike.